You are invited to join our mailing list and receive our e-newsletters featuring gallery exhibits, events, artists, and new artwork at Galleria Silecchia. Autographed copies of Glenna Goodacre’s recently published, full-color book Glenna Goodacre, Sculpture are available. In her own words, Goodacre describes the inspiration for and the creation of her most unforgettable bronze sculptures that span her 40 year career. 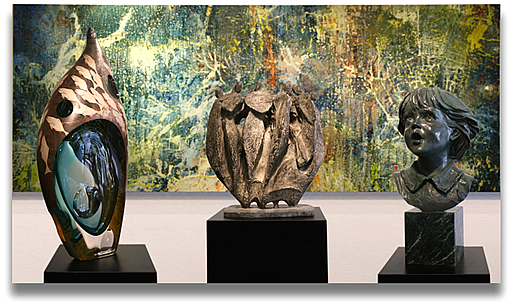 New works by Glenna Goodacre, American Bronze Sculptor are now in the gallery and available for acquistion. Internationally renowned for her large-scale figures, Goodacre is exhibiting a few last of edition and rare collectibles. The illuminated art that graces our two galleries are the beautiful, hand-painted glass chandeliers and wall sconces of Ulla Darni. Ulla's unique stylings and designs allow the collector to create a serene ambiance in harmony with any interior design choice. The wide palette of color choices on chandeliers ranging from 18" to 72" in diameter allows the collector to create personalized illuminated art. American Photographer, Environmentalist, Conservationist presents luminous and powerful sepia toned photographic images representing his two life-long passions: the oceans and classic sailing vessels. Kahn is an accomplished artist and his limited edition photographs are available beautifully matted and framed or unframed. Original watercolors and oils of landscapes, seascapes, cityscapes and still life. Unique abstract paintings and sculpture in aluminum that demonstrate dynamic movement and organic forms. Hiroshi Yamano, Japanese glass artist, Zen Gardens: Rakow Award winner; blown glass vessels and hot sculpted glass with gold and silver leaf engraving and copper electroplating: cut and polished blown glass forms that reflect Eastern traditions and Western innovations. Very unique...very beautiful. The Art of Telling a Story... Awarded the Draper Grand Prize from the The Portrait Society of America, Glenn Harrington presents his original oils on linen of figurative subjects, portraits and landscapes. These sensitive and classical renderings capture moments in time yet are timeless. Harrington seeks and achieves a transcendant quality garnered from keen observation of the human spirit. His works are also beautifully framed. Harrington welcomes private portrait commissions. Ulla Darni presents new Original and Multi-Original reverse, hand-painted chandeliers, sconces and lamps. Contemporary and traditional oils on textured canvas with 24K gold and silver, bronze and gold leaf. Gorbachev combines the history, mythology and cultural heritage of his homeland with references to Russian and Balinese Folk Art, African rock drawings and masks. The figurative bronze work of Glenna Goodacre, including her life-size sculptures, rare works, interpretive busts and award-winning coin design are part of this exhibition. Selected works from Goodacre's "Inspirations" from The Irish Memorial, are available. Unique abstract paintings and sculpture in aluminum that demonstrate dynamic movement and organic forms. Tamanian's original, multi-layered abstract paintings on aluminum, and his aluminum sculpted vessels are also ideal for both interior and exterior installations. This highly energetic artist welcomes residential as well as commercial commissions in both small and large scale. The aluminum material and his water resistant finishing techniques allow his work to be incorporated in almost any commerical or residential setting including unique and artistic designs that can be created for any space in which you desire an unusual and unique treatment. Original oils on canvas of figurative subjects, landscapes and portraits. Opening Night 2019 To Be Announced!